I found this for 178 yen ($2.28) at Family Mart for 290 grams (10 oz.). That's on the expensive side, but it is a pretty large portion size. This is zero calorie jelly and I'm guessing the large amount is to fill a belly that wants to be full without any risk of weight gain. There are more and more of these products in Japan all of the time as the quest for an alien body image has spread here from the West to the East. The company that makes this, Tarami, specializes in making a wide variety of gelatin desserts. Their main business is doing the kind with sugar based on fruit and real fruit flavors. Their zero calorie lines are split into two sizes with the smaller ones being fruit flavors and the bigger ones adding more esoteric varieties like cola and "white" to the line up. Their web site shows farms and lots of orange trees, but somehow I doubt their 400 or so employees are working the farms to fortify their gelatin desserts. As for what "white" tastes like? It tastes like a sweet, slightly fruity Asian fruit cocktail and is somewhat yogurt-like. It's both a little tart and sour, but the flavor is on the mild side with no overwhelming sweetness. Since I'm accustomed to artificial sweeteners, this didn't bother me. In fact, I'm nearly immune to the chemical cocktails (Acesulfame K, Sucralose, Aspartame) that are used to formulate diet foods. The part where this shines is in the texture. It's a cool, soft and slick jelly with chewy bits of nata de coco in the bottom. 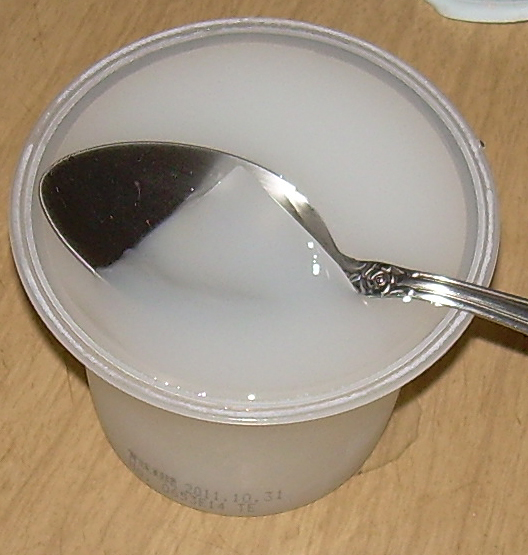 The textural variation that comes from the nata de coco is quite welcome and lends the illusion that you're eating something with a bit of substance. 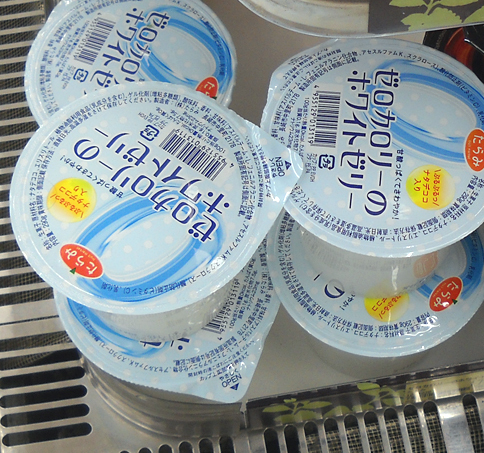 I should note that many Japanese gelatins like this include blocks of konnyaku jelly or nata de coco. I liked this just fine, but I wasn't mad about it. The truth is that I can make more flavorful zero calorie jelly myself using plain gelatin, packets of artificial sweetener and whatever flavoring agent I want (coffee, tea, lemon, lime, etc.). That doesn't mean I couldn't see myself buying this again and it was perfectly pleasant. However, I'd only purchase it under the most unique circumstances because the size is bigger than I need and the price higher than I'd prefer to pay. Chances are, I'll never sample it again. Just a gentle reminder that there is a contest running for two weeks to win a few snack and snack-related goodies. If you'd like to enter, the details are in this post. have you seen the Ambasa - sour white? It tastes like Sprite with a bit of yogurt . . . surprisingly not bad. I guess yogurt kind of tastes like white. I believe they're called jellies because they aren't necessarily made with gelatin, which is a gelling agent derived from hooves and bones. In my experience, Asian jellies tend to be gelled with agar, which is derived from red algae. There are also specific snack jellies made from seeds or other plant material, such as aiyu. Did the package indicate what kind of gelling agent was used? Sorry, when I use the word "gelatin", I'm referring to the food, not the ingredients used to create the gelatin. In American English, "gelatin" is used to describe any food like this type, not necessarily foods made from bones and hooves.Though "gelatin" describes that as well, it's also the common generic name of any dessert of this type. I hope that makes sense. I'm sure this is made from agar agar, though I no longer have the packaging and can't check. If I use the Japanese-English word ("jelly"), then it is confusing in English because "jelly" is what we spread on toast. Somehow that all came out much more confusing than I'd hoped, but suffice it to say, if I refer to this as "jelly", people are going to expect something that looks like jam or preserves, not gelatin desserts. After I posted that, I realized that whether the gelling agent is agar agar or bones and hooves stuff, it's called by the same name, "gelatin". I've got a bunch of Japanese gelatin (derived from seaweed) and it is called "zerachin" (ゼラチン), the katakana version of gelatin. Somehow the package titling flashed into my head just a bit too late. Given that even they call their gelling agent "gelatin", that makes it even more curious that they call this "jelly". I guess they're just attempting to distinguish between the agent as it is sold as unflavored stuff (which I use to make homemade gelatin desserts) and the flavored varieties sold in stores.